June 7, 2010 - Embry-Riddle Aeronautical University, a leader in aviation education and safety, is launching the International Center for Aviation and Wildlife Risk Mitigation to help manage this growing hazard. The new Center, based at Embry-Riddle's Prescott, Ariz., campus, will bring together top aviation wildlife experts to share and develop new research and management solutions to reduce the dangers and serve as a resource to airports around the world. The Jan. 15 ditching of US Airways Flight 1549 in the Hudson River vividly illustrated the dangers of midair collisions between birds and aircraft. But what led to the "miracle on the Hudson" happens more often than the public realizes. Bird and wildlife strikes cause more than a half-million hours of aircraft down time and cost U.S. civil aviation more than $500 million annually, according to a report by the U.S. Department of Agriculture. And the threat to air safety is on the rise with the expansion of many wildlife species that are hazardous to aircraft. The Center is an initiative of national wildlife expert Archie Dickey, an associate professor of aviation environmental science in Prescott, Ariz., who serves as director. Dickey created and has managed the FAA's web-based wildlife strike database since 1999. The FAA site is a compilation of data about aircraft and wildlife strikes around the country, and data is voluntarily reported by airport officials. "We created this Center to support data collection efforts, develop better solutions to reduce wildlife strike hazards, and serve as a clearinghouse to share this information with industry and organizations that need it," Dickey said. "The US Airways landing in the Hudson River was the wake-up call that we needed to accelerate our plan to create this Center, which was several years in the making." The new Center is designed to be part of a larger comprehensive overhaul of the U.S. bird strike hazard management system proposed by industry experts and now under review through the Aviation Subcommittee of the House Committee on Transportation and Infrastructure as well as the FAA. One of the Center's goals is to bring together and leverage broad industry, academic, and government supporters to gain federal and state funding to establish the Center as the pre-eminent national facility for wildlife/bird strike data collection, research, and development, similar to FAA-sponsored Centers of Excellence now operating at Embry-Riddle and other universities. The Center is advised by prominent experts in aviation safety, aerospace engineering, aviation law, and pilot training. They include Russell DeFusco, Ph.D., founder of the wildlife management consultancy BASH Inc.; Paul Eschenfelder, aviation consultant and president of Avion Corp.; and Ed Cleary, retired FAA wildlife biologist. Students enrolled in the Aviation Environmental Science degree program at Embry-Riddle, which Dickey also chairs, will assist with research at the Center. The new Center will develop and promote solutions for managing wildlife around airports and training pilots and airport personnel to avoid aircraft collisions with birds and wildlife. Some approaches already show promise, according to Dickey. For example, certain marine radar has been modified to detect birds near airports, and the mowing of airport-area grass to a height of six to 12 inches deters the presence of larger birds. The Center will work with bird strike committees in North America and abroad to collect, maintain, and disseminate relevant data and research. The Center will develop training programs, management policies, and operational plans regarding aviation and wildlife risk mitigation to effectively and accurately facilitate communication with the scientific community, public, media, and government organizations. 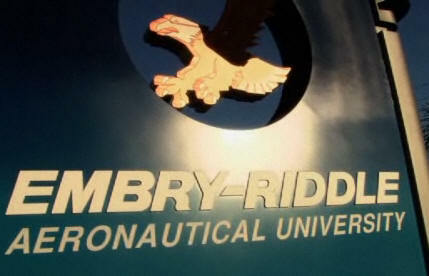 Embry-Riddle Aeronautical University, the world's largest, fully accredited university specializing in aviation and aerospace, offers more than 30 degree programs in its colleges of Arts and Sciences, Aviation, Business, and Engineering, educating more than 34,000 students annually in undergraduate and graduate programs. For more information please visit their website.